SPIKES speaks to the unlikely track and field hero who might just yet become one of the greatest two-lap runners ever. Meet Mohammed Aman, Ethiopia’s 800m world champion. Think Ethiopian athletics: think long-distance and marathon heroes. The likes of Bekele, Dibaba, Defar and Haile. For the older generation, it’s Abebe Bikila or Miruts Yifter (the Shifter). But there is a young man from the proud East African nation who breaks that mould. And he is the world indoor AND outdoor 800m champion, Mohammed Aman. There’s a chance that could happen. After all, Aman, who turns 20 tomorrow (10th January), has proved it possible. He’s good. Very good. The featherweight two-lap star is just 58kg and 5ft 8ins tall. He cuts an unimposing physical figure alongside the likes of 800m rivals David Rudisha and Duane Solomon (both 6ft 3ins). His stature belies amazing strength and blistering finishing speed, best demonstrated in Moscow’s Luzhniki Stadium last summer. Aman breezed past the USA’s Nick Symmonds in the final 50 metres of the world 800m final. Born in the town of Asella – home of Haile, Dibaba, Bekele and two-time Olympic 10,000m champion Derartu Tulu – Aman wasn’t short of local inspiration. Showing fleet of foot on the football pitch, Aman showed early athletics promise when he finished sixth at a Grand Prix meeting in Abuja in Nigeria, aged just 14. It wasn’t long before he made his mark. Flourishing under the coaching of Negusse Gechamo, Aman won 1000m gold at the inaugural 2010 Singapore Youth Olympics. His progression continued in 2011, with silver at the world youth champs; eighth place at the senior world champs and a third national record of the season of 1:43.37, in Rieti. In his final race of the year, in Milan, he caused a sensation by inflicting the only 800m defeat of the season on world champion and world record holder David Rudisha. Early in 2012, Aman became the first Ethiopian to land a global 800m title: striking gold at the world indoors in Istanbul. World first: Aman takes gold at the Istanbul 2012 World Indoor Championships. In London 2012’s unforgettable 800m final, where Rudisha shattered his own world record, Aman ran brilliantly for another national record (1:43.20) but only finished sixth. Seven of the eight finalists registered personal best times. Post-Olympics, he ended his campaign in style, winning Diamond League races in Stockholm and Zurich before capping his season with victory at the prestigious ISTAF meet in Berlin. It was the middle of those three victories, in Switzerland, that really caught the eye. He managed to lower his national record to 1.42.53, and once again became the only man that year to beat David Rudisha. Just like in Milan a year earlier, the conditions in Zurich were wet. So is that the key to beating the greatest 800m runner ever? “The secret will remain secret,” says Aman, with an air of mystery. fit enough to beat whoever I face"
With Rudisha injured for much of 2013, he did just that. Achieving all the goals he and his coach set out at the start of the season, Aman won the Diamond League title, world championship gold and ran a personal best 1:42.37 in Brussels. This elevated him to joint ninth on the all-time lists, and world number one for 2013. Aman won ten out of eleven 800m races, a season he describes as “perfect,” but his groundbreaking success in the Russian capital means the most to him. 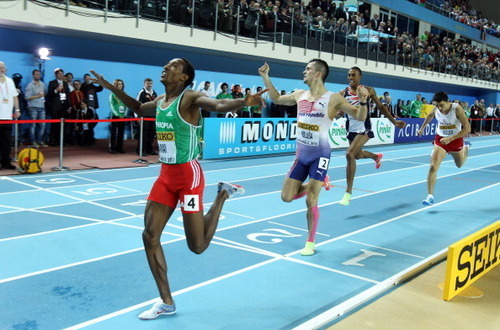 Retaining his world indoor crown and lowering his 800m PB are two of his major goals for 2014. Aman, who loyally follows Islam, is confident of one day running 1:40 (Rudisha’s world record is 1:40.91). Beyond that, Aman believes that his long term ambitions in the sport are over the longer distances, much like his fellow Ethiopian greats. "Don’t tell everybody how good you are"